Cursive is one of those bands that has thrived through a couple of generational musical shifts, editing their sound and adapting it to reflect their own personal lives. A couple of stops along the way were the instrumentation around cellist Gretta Cohn in The Ugly Organ, to the facade of perfection portrayed on Happy Hollow. However, I Am Gemini absolutely tops all of those prior releases. The album is ominously light, and airily dark. Lyrically, there are many references to angels, demons, and detailed metaphors to suit the mood perfectly. Musically, the album is wonderfully creative, with each song being individualistic, but blending into one another with immaculate ease, to a place where the separation of tracks is undifferentiable, or more so, unimportant. 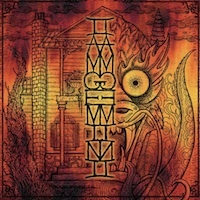 I Am Gemini brings a whole new Cursive to the table, and with it, a perverse tragedy that redefines the detail and beauty of the concept album. In order to write a fair review of this album, I need to talk about it in two parts. That is honestly the only way to do this album justice. First, the musicality of the album is beyond gorgeous. The entire thing is a piece of art, and each track on its own shows character with subtle nuances that really entice the listener, throwing in so much more personality than would ever be possible on an album that isn't based on a central theme. From the intro in compound time, the flowing "This House Alive", an easy, headbobbing piece that drifts along introspectively, yet smoothly as can be, to the metaphor filled, "The Sun And Moon", somewhat of a pop-rock impression that starts relating the two characters, Cassius and Pollock, as - yes, you guessed it - the sun and moon. As the album progresses, the mood continues onwards, spiraling to a darker and more depraved place, to a point where "The Cat And Mouse" depicts a frantic point of insanity, fast paced, adrenaline-filled, and murderous, a musical feat only enhanced by Tim Kasher's ability to portray paranoia and rage, as well as a palette of other emotions at will through his voice. The whole set of tracks portrays this set of feelings through the music very well indeed, but is even further progressed through the lyrical quality of each song. In fact, the setup of the entire album is very impressive - looking at the album liner, it's actually set up into a two part play, with stage directions between the lyrics, which are the lines for different sets of characters, many choruses being said by various angels and demons, while the verses are sung by either Pollock or Cassius. And their lines are strikingly well-written, colloquialisms and references strewn throughout, like in "Double Dead", where Pollock is talking to Cassius, who is passed out and at the will of Pollock, who sings, "Out cold, run over by the boulder of Sisyphus / Doesn't it seem to get a bit repetitive? / Over and over and over again", a witty reference to the classic Sisyphian struggle, which Cassius experiences as a balance between his foolish excitement and his deeper suspicion of Pollock. Kasher really hit it spot on with lyricism in this album, in that there are so many intelligent allusions that it's really difficult not to appreciate each of them as they race by. I could go on and on about I Am Gemini, and I would surely love to, but to keep it concise, I thoroughly loved this album. The music behind the album reflects the flexible and fluid mood, and the orchestration, in loving tandem with each and every venomous verse, has a certain influence that's impossible to escape once you're two or three songs in. In fact, I don't really know which way Cursive's going to go after this album - it's actually a valid concern of mine that this is their peak, and they won't be able to match up to this. Then again, as I've said plenty of times before, this album is an absolute testament to Kasher's ingenuity and creativity, so I sincerely hope he proves me wrong. The album is out February 21st. You can take a sneak peak at two tracks off of the album, "Wowowow" and "The Sun and Moon", on their MySpace.